Right now I’m sitting in a presentation at NASA on what the space industry will look like in 2100. During the whole thing they talk about what it will take for us to get there. Near the end of the main presentation they talk about how they will need to go from Conservative to Collaborative. While I liked what they said, I felt a very important piece of the puzzle was missing: The human part. If they don’t get that right, the other won’t work out. And then “Larry” got up at the end and quoted Seth Godin’s post in which describes how when a company grows in size, it slows down. Bureaucracy, policies, rigidity, and the fear of failure increases. Even really good people, really well-intentioned people, then, end up in organizations that plod toward mediocre, interrupted by random errors and dropped balls. Seth presents the solution by saying “Go for greatness.” And I completely agree. Yet if we stick someone in a horrible environment and say, “Be Great!” and we will find that almost all of the time, they will either a) be sucked back down to mediocrity or b) be so inspired that they leave and are great somewhere else. Why focus on employee effectiveness when the environment they are in will not allow them to be great? Most organizations have painted themselves into a corner so much so, that it is nearly impossible to be great as a company or allow their employees be great. The desire is there, yet because of the way they are set up and the way they function, they can NEVER reach the height they would like to. It will be impossible. I have seen enough companies go through this that I can be that definitive. If we don’t create an environment of relationships that is toxic and non-trusting, I don’t care how tight the schedule is, how technically advanced the solutions are, or how cheap they may be. If the environment is not conducive to allowing the employees to be great, then even great solutions will hit a brick wall. Granted, the final solutions that will emerge may be mediocre and suffice, but they won’t be High-Fidelity: achieving the level they know they are capable of. Create a different environment that makes it EASY to think and act differently, to take on a challenge, to take risks, etc. If you don’t change the environment, change will be slow, frustrating, and expensive. So our focus needs to be on creating an environment that will allow us to create High-Fidelity companies. How can we work differently? These three posts can show you how. From a review of a book to hands on experience from the CEO of WordPress. They will give you some great ideas to start your week. Dare We Challenge The Concept of “Management”? But what if they aren’t. What if what we assumed was correct was only a cosmic fad? To further that logic, what if water was as it is today – stable – and the assumption was that it would never change, but then it became unstable and did vary in temperature? How would that change the way we live? What effect with that have on our everyday lives? 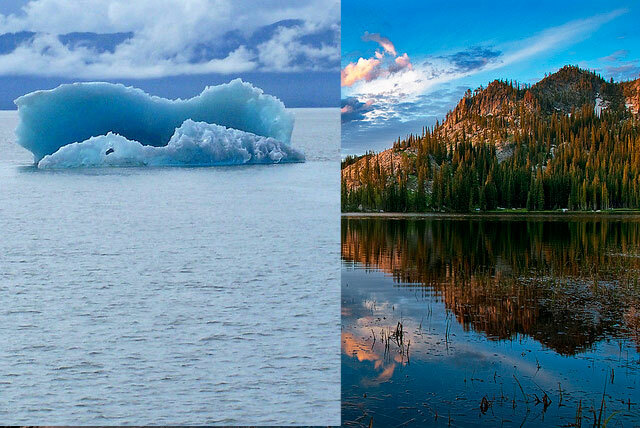 How would we think about water differently? I have been oddly fascinated with the concept since my father and I had that discussion. As I have grown I have found this concept would present itself time and time again. It has appeared in relationships, work, religion, philosophy, physics, biology, and my construct of how the world fundamentally works. When we don’t challenge our assumptions, we try to put ourselves in a safe place and stay there. But then we get stuck. One way people get stuck is to get a steady full-time job and think they are safe. That is until they are laid off and are devastated. They never saw it coming and don’t have a backup plan. There are probably thousands of pieces of our lives that we take for granted and make a grand assumptions. One of those assumptions is that management is like the air we breath. If we have an organization, the way to manage them is by management – the stuff MBAs are made of. In fact, it has become such an integral part of how we work that to try to explain management without using the word manage would be difficult for many. It just is the way it is. It is our organizational air. What if we were able to “manage” a workforce, a company, processes without management in the way we think about the word? Is it possible? Dare we challenge the notion? Dare we reimagine organizations? Not only should we challenge it, but I believe there exists a need to do exactly that. Just because we can take a new balloon and blow air into it, it does not mean we can do that forever. At some point it will pop. Conditions change. The latex becomes thinner, weaker, and more vulnerable. Just because we have been able to manage companies in the past using “standard” management principles we learned in college does not mean that those best practices won’t change and possibly ruin our business if we don’t change. And when they do change, how will we recognize them? We can either challenge them or let the balloon pop and allow the circumstances to challenge us. Everyone talks about how bad mediocrity is. About how we shouldn’t tolerate it. About how it is a cancer to your organization, let alone your life. I agree with them all. I’ve even written about it before. Although I’m with you, I don’t care any more. Is it a cancer? Can it destroy your company? Can it wreak havoc on production? Yes. But still, I don’t care. Because mediocrity is a symptom, not a cause. It is a tell-tale sign that something else is wrong. In a High-Fidelity company mediocrity doesn’t exist. And that is why I don’t care. Because if your company is set up correctly, it won’t be the problem that it is today. 1) Accountability to everyone, not one person. A team member can get away with fooling one person. It’s easy. And we see it all the time. One person is the darling of the team (at least according to the manager) and the rest of the team can see right through the facade. But when you are accountable to everyone around you, it is very difficult to get away with anything questionable. 2) Having a WHY. If you know why you are working and it is your passion or at least something you are interested in, then mediocrity won’t exist. If you are stuck in a job you can only tolerate, however, and governed by a boss and by rules that only seem to multiply, it is easy to let the mediocrity creep in. There are times when I have received an official recognition for not only just doing my job, but for (what I considered) playing. I learn so much by what I do that a certificate of achievement would pale in comparison to the satisfaction I received from the experience. So, Step 1: Stop celebrating mediocrity. Step 2: Create an environment where mediocrity can’t live. Then, mediocrity won’t even matter. I hear C-level executives say things like this all the time. They peer into the future and recognize the need to move their workforce into a Future of Work mentality and practices. Yet, when it comes down to implementation, the shifts are rarely as deep and meaningful as they intended. It makes people like me clench our fists, raise them to the sky and shout with frustration, “Why, Oh Why? !” Of course I have to lock myself in my closet before I do something like that so I don’t look foolish. And at the same time, I understand. The CxOs want it one way, but things like politics, tradition, and other invisible forces get in the way or slow initiatives like this to a halt. I get it. I’ve seen it. I’ve lived it. I don’t like it, but it is reality. I do believe, however, that if we understand the difference between what was intended and what is often delivered, we can try to shoot for the correct intervention and stay away from (and not settle for) one of a lower quality. It took a lot of dissecting, but I think I found a way to explain the difference in a way that can motivate teams to shoot for the best, rather than settle for what is easiest (and thus, much less effective). In working with a client, I noticed that they were falling into this trap. They were leaning toward checking off the box with lower level solutions. It isn’t that they were not compitent (because they certainly were), it was just that all the forces that we all know so well were pressuring them to a lesser set of solutions. I created this matrix to explain the difference between two levels of solutions. And as I did, I realized that just about every company I start working with has initially fallen into this trap. It is very easy to think that we are doing Transformational work when we are only doing Tranference work. So, I share this will all in hopes that it will help you, too. On the X axis is “Supporting Structure.” This encompasses technological, financial, moral, political, cultural elements of the overall structure that are there to support the action. On the Y axis is “Purposes/Practices.” Why is something being done? What is that? It is the purposes for which we are carrying out a certain action. It is more than just how we are doing something, but also WHY we are doing it. Different WHYs lead to different WHATs. In the Status Quo Quadrant (bottom left) nothing changes. It is the status quo. This is the default and fall back position. When things don’t go right, this is the refuge employees seek. It is comfortable and familiar to them, even if it might be the wrong thing to do. Employees have a tendency to migrate to this position. Unless certain fail safes are put in place, it will be human nature to revert to the old way of business. Always be watchful for this slip. It is dangerous and often toxic to change initiatives. The Impossible Quadrant (top left) actually doesn’t exist in practice, but it does in theory. As an example, years ago I was asked to go take the company’s main process which produced 80% of the revenue and to find a much faster, slimmer alternative. I worked for months with many people. In the end I transformed a process that took 30 days and 20 handoffs, to 15 days and 6 handoffs. The efficiencies gained were incredible. There was one thing missing: a new support structure. I was asked to create new working purposes and practices, but not given any support on the structure end of things to make any changes. And guess what happened? Nothing. Not one thing changed. I was incredibly disappointed. It was talked up as a huge win for the company, yet because it didn’t have supporting structure to make the changes, nothing happened. It died. As the years rolled on pieces were picked up and implemented. I am sure it wasn’t pointing back to the work I had done, but rather they had to come to the same conclusion I had already come to and implemented it bit by bit. A new way of working with new purposes without the supporting structure will never actually happen. Rather, they will fall back into the Status Quo Quadrant. I know of another person who wanted to create a Enterprise Social Network for her company. She wasn’t given a budget or a team (and, obviously, no support), but the OK to press forward. And you know what? She did it! Three years later it was decommissioned because the supporting structure was not there. It died a sad death. The Transference Quadrant (bottom right) is where many companies land because they don’t have what it takes to go to the top right. Rather than going for a big win, they go for the mediocre win. The win that is far less difficult and thus far less effective. It looks like there was a big change, but all they did was take the same purpose and move it to another place. Instead of holding in-person meetings, a company might move their meetings to a virtual space to allow many more people to join. This is the same purpose moved to a new location (physical to virtual). This change can be very beneficial. So, it must be noted that the Transference Quadrant in and of itself is not an evil quadrant. Sometimes this is all that needs to happen. In this case, a move of location is a big win and can save a company a lot of money and time lost. The danger here is shooting for the Tranformational Quadrant but only ending up in this quadrant. It can be deceiving. Too often, the Tranference Quadrant becomes a checkbox. “The CEO said to make a change, so we did,” but nothing really changed. Sure there is some change, but it was not to the extent intended. 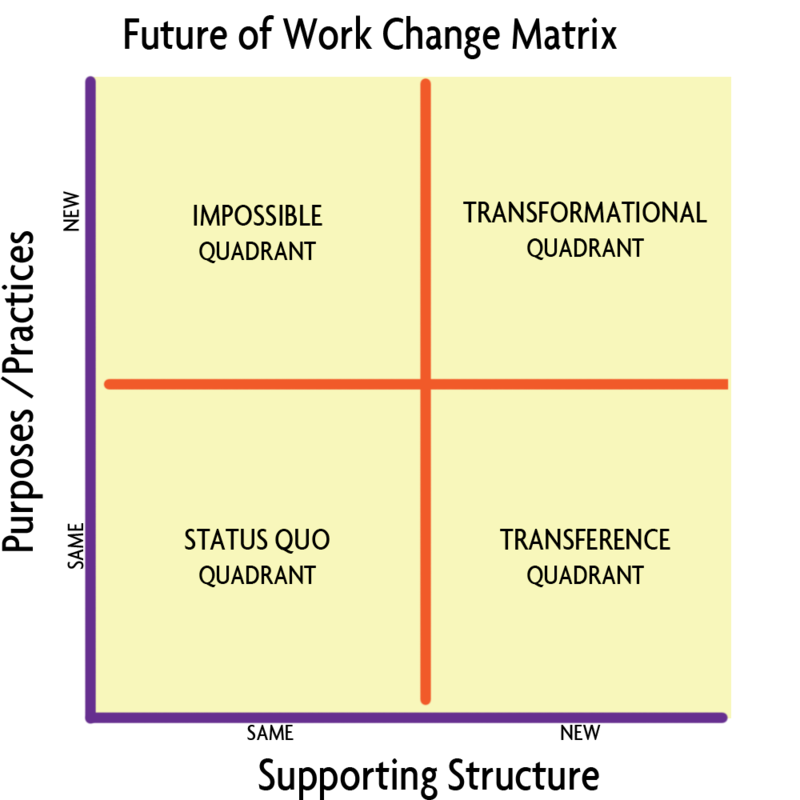 The Transformance Quadrant is where the Future of Work lives: New purposes with a new supporting structure. This is where the money is! (Not literally, but literally – you know what I mean?!) The change that everyone talks about takes a new supporting structure which, in many times, is radically different than the Status Quo. It also looks at new ways and purposes of working. The end goal (deliver what the customer wants) may be the same, but how we get there is very different. And the Tranformational Quadrant lives on difference characteristics (part of the Supporting Structure). It doesn’t play by the same rules. I worked with one team where their main process was closed, secretive and guarded. Needless to say, it took a long time and a lot of people to manage the process. When we revamped it using the principles of transparency and trust we found that not as many people needed to be involved in the process and the process took less time. Their end purpose didn’t change, but their work purposes did. They wanted to be more transparent. As a result they saved not only time in the process, but over $100,000 a year in lower process costs. And that was just one relatively small process! When shooting for the Tranformational Quadrant, it is easy for many to become weak in their resolve to make a real change. They realize that it might take going out on a limb and risking some credibility or political clout. I have seen some not make the change because they thought their budget would be lowered, even though the overall net gain would have dwarfed the budget loss! There is a pull the the familiar, to the less risky. And that pull is down to either the Tranference Quadrant or back to the Status Quo. When evaluating your next big move, decide which it needs to be: Tranference or Tranformational. If it is Tranformational, make sure you identify new work purposes & characteristics and the new supporting structure to support you. In fact, make sure everyone on the team understands the characteristics of that quadrant so they know what to shoot for. And then don’t give up. This is another element in the recipe for the Transformational Quadrant: Boldness. You will be often times going against work traditions your company holds as sacred. If it is the right thing to do, press forward. The spice of boldness is invaluable and required.